Spring Celebrations with Stylish Connotations! WINTER IS STILL HOLDING ON WITH ALL OF ITS MIGHT, BUT THAT DOESN’T STOP US FROM CELEBRATING SPRING AND ALL IT HAS TO OFFER! April is an infamous event month! With Passover, weddings, anniversaries and outdoor celebrations galore, it’s the time of love and laughter as the cool weather (hopefully) begins to surrender to the warmth of spring! So keep your loved ones tucked close and rejoice this holiday season! Whether you plan on hosting an outdoor haute couture, or a gilded ballroom gala- or even just an intimate dinner party with your closest family and friends… your table setting and dinner service will make or break the event! Even with that in mind, don’t stress, because Fineline Settings has the setting for you, regardless of whether your shindig is under the moonlight or a chandelier! Your event is unique and distinctive, and with that in mind, Fineline prides ourselves in supplying you with dining disposables that are both striking and complimentary to your particular tastes. 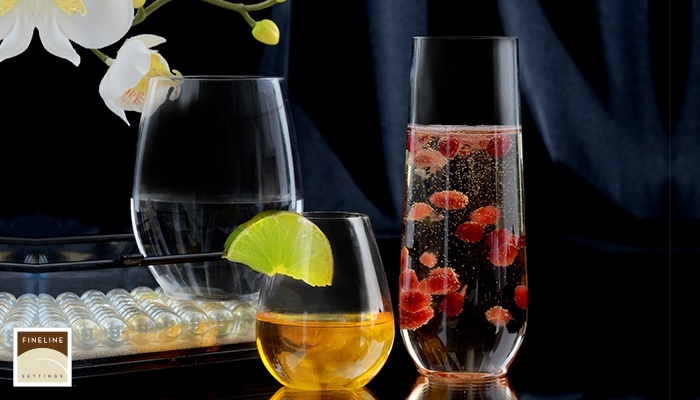 This 2016, take special note of our new Renaissance Stemless Goblets & Flutes. We’ve upgraded your cocktail hour with sleek, modern style. Doting our renowned PET clarity, and the unshakable durability of disposable plastic, your event will be both elegant and effortless! No matter your tastes, our stemware will lend its loveliness to any one of our contemporary or classic collections of plates and bowls. From the stunning, old-fashioned elegance of our new Heritage Collection, to the striking Cobalt, Silver, or Gold finished Square Splendors, your tablescape will highlight your menu and celebrate all that is uniquely you! 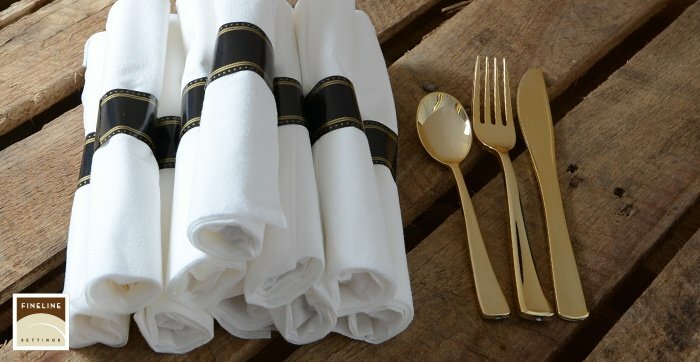 Not to mention, our exclusive and well-loved Golden cutlery are now available in Retail Bags, and Rolled Napkin Fork, Knife, and Spoon opportunities! We hope that your spring 2016 has been full of laughter, love, and fun! Fineline can’t wait to follow you through your fashionable table setting adventure, and we’ll always be here to lend a helping hand!